The online news site, InkFreeNews, reported on today’s graduation at Grace College and Seminary. A portion of the story appears below. Click here for the complete article. Students walk the stage to receive their diplomas. 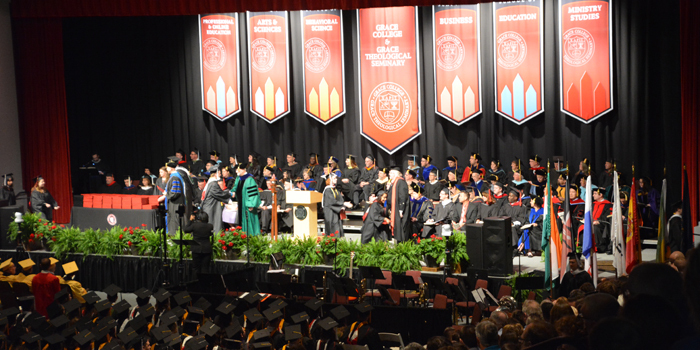 WINONA LAKE — Over 500 Grace College and Theological Seminary students walked the stage to receive their degrees during commencement held at the Manahan Orthopedic Capital Center today, Saturday, May 13. Each year, Grace’s senior class elects a faculty member to deliver the commencement address. This year, Dr. Joe Graham, associate professor of behavioral sciences, was chosen to speak. Jonah K. Pettet, representative of the undergraduate student body, gave the student greeting, while Nicholas A. Stanton, representing the seminary and graduate student body, gave family recognition. A special presentation took place to honor Dr. James Custer, teaching pastor and senior pastor emeritus at Grace Polaris Church in Westerville, Ohio. An alumnus of Grace College & Seminary, Custer has served for 17 years on the Grace College & Seminary board of trustees and has been named Trustee Emeritus. Dr. Katip recognized Dr. Custer’s 50 years of ministry and service during the commencement ceremony.